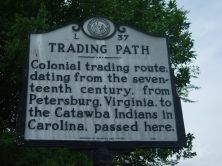 Colonial trading route, dating from the seventeenth century, from Petersburg, Virginia, to the Catawba Indians in Carolina, passed here. 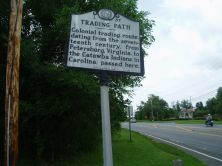 The course of the Trading Path entered North Carolina near present-day Norlina, then passed through Bullock, northern Durham County, Hillsborough, Mebane, Alamance, Julian, central Randolph County, Denton, western Davidson County, Salisbury, and Concord. In Mecklenburg County the path forked, with a spur to Indian Trail and Waxhaw, and another to Charlotte and Pineville. William S. Powell, ed., Encyclopedia of North Carolina, 533-534—sketch by R. P. Stephen Davis Jr. 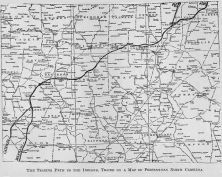 The Trading Path, Douglas L. Rights, "The Trading Path to the Indians," in North Carolina Historical Review, (October, 1931) p. 404.